Amazon kicked off live sports on Prime Video in 2017 with a ground-breaking NFL partnership that brought 11 Thursday Night Football games to Prime members worldwide. While Amazon Prime Video has continued the NFL partnership for 2018 and 2019, Amazon has launched AVP, PGA Tour, NBA League Pass, and more. This is just the beginning. 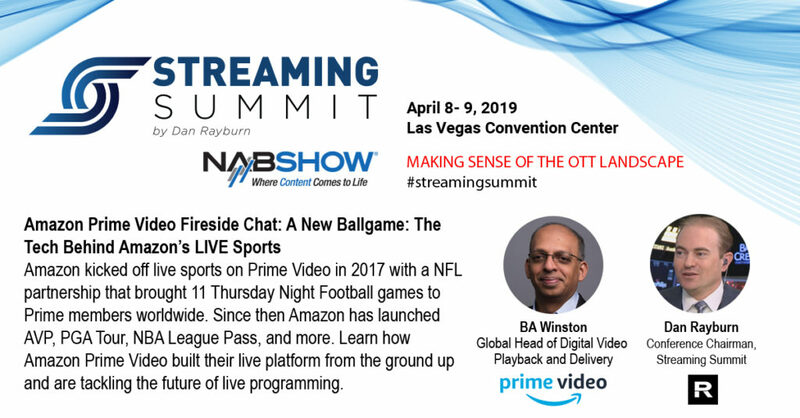 At the Streaming Summit, taking place April 8-9, at the NAB Show, BA Winston, Global Head of Digital Video Playback and Delivery for Amazon Prime Video, will discuss how Amazon Prime Video built their live platform from the ground up and are tackling the future of live programming with innovative experiences and high quality at scale.